Divide ham & cheese evenly among rolls. Prepare honey mustard by combining mayo, honey, dried mustard, and 1 tsp. poppy seeds. Divide honey mustard evenly among sandwiches. Combine 1 Tbsp. melted butter and 1/4 tsp. 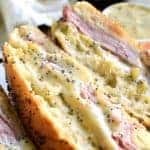 poppy seeds; brush on top of sandwiches.